“Islam is a religion of peace. 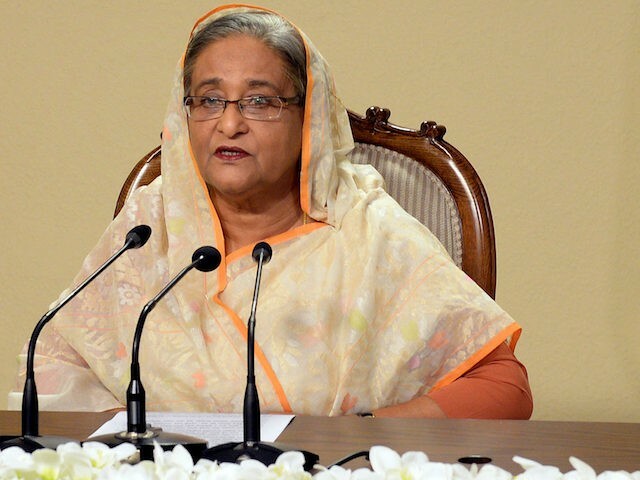 Stop killing in the name of the religion,” Hasina said in a televised message following the culmination of a ten-hour siege of a bakery popular with foreign nationals in the nation’s capital, Dhaka. “Please stop tarnishing our noble religion … I implore you to come back to the rightful path and uphold the pride of Islam,” she asserted. Hasina announced two official days of mourning following the attack, and appeared to address not only the Dhaka siege but a string of hacking murders nationwide targeting LGBT writers, secular thinkers, and those publicly critical of Islam. “What kind of Muslims are these people? They don’t have any religion,” she added. Like many of the previous jihadist murders in the country, the twenty people killed in Dhaka were “brutally hacked to death with sharp weapons,” according to Brigadier General Nayeem Ashfaq Chowdhury. In addition to the hostages, two police officers lost their lives while storming the cafe and ending the siege. Witnesses say the jihadists could have killed more people, but freed those who identified as Muslim and could prove it by reciting the Quran. “They pointed a gun at my chest and asked me if I was Muslim… I begged for life… they let me run away,” a waiter identified as Ashraf in the capital’s Dhaka Tribune told the newspaper. “The attackers waited some moments and screamed Allahu Akbar and fired blank shots indiscriminately and blasted handmade bombs,” he added. The Islamic State has taken credit for the attack, posting photos of the men they assert were the five jihadists responsible on social media, posing with firearms in front of the Islamic State flag. Bangladeshi police assert, however, that the men were all from Bangladesh, their families still present in the country, and do not appear to have any organizational links to the ISIS operation in Syria and Iraq. It is unlikely, they add, that ISIS Caliph Abu Bakr al-Baghdadi orchestrated or even funded the attack, though ISIS propaganda likely inspired it. In the April issue of Dabiq magazine, the terrorist group’s English-language publication, Islamic State propagandists described “Bengal,” their name for the northern Indian subcontinent, as an “important region for the Khalifah,” calling for not just a larger presence of ISIS in the region but locally organized attacked. The practice of forcing hostages to recite Quranic verses or be killed, however, has most prominently been seen in Africa, where the Somali jihadist group al-Shabaab executed it in an attack on Kenya’s Garissa University. Al-Shabaab is affiliated with ISIS rival Al Qaeda, though a rebel faction has responded positively to overtures by ISIS. The day before the Dhaka attack, the U.S. Department of State designated Al Qaeda in the Indian Subcontinent (AQIS) its own terrorist group. “The Hasina government should not only worry about IS (the extremist group’s claim for the restaurant attack has to be verified) but also about the fact that Bangladesh is one country in which the al Qaeda and the IS seem to be competing,” columnist Harinder Baweja writes in the Hindustan Times. “Security experts point to the linkages between the local jihadist group, the Jamaatul Mujahideen Bangladesh (JMB) and the IS and between Ansarul Bangla Team (ABT) and the al Qaeda.” Baweja cites experts asserting once again, however, that there appear to be no direct ties between Raqqa – the capital of the ISIS caliphate – and Dhaka.